Home Your Floor, Our Blog Which wood floor is right for you? It’s timeless, the natural look. Year after year, wood flooring continues to be popular and 2019 is no different. If you’re already sold on the idea of wood floors for your home, the next question is whether you should choose real hardwood floors or go with laminate instead. The answer comes down to 4 main points you’ll need to consider: price, durability, maintenance and style. Natural hardwood floors are incomparable in aesthetics but that comes at a price. The more exotic the wood, the higher the price you’ll need to pay. Meanwhile, laminate is made from pressed composite wood with a photographic layer that mimics the appearance of natural wood, which comes in at a lower price. There are savings to be had with the installation too. 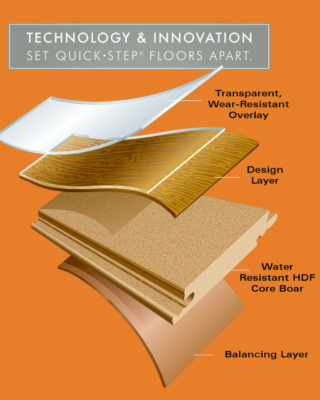 Laminate from leading supplier Quick Step uses a patented Uniclic system for easy installation. In contrast, installing hardwood floors requires greater skill and often preparation of the subfloor, which adds to the cost. The inherent design of laminate means it is resistant to moisture and can be used in more humid environments, such as the bathroom, without worry over warping. Scratch resistant surface layers make scuffs less likely, adding to their long-lasting nature. 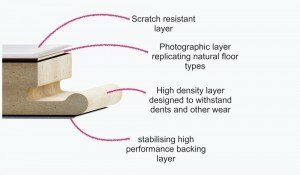 Quick Step goes as far as providing warranties of up to 25 years. Hardwood floors on the other hand are more prone to scuffs and scratches, especially in high traffic areas. But for some, this simply adds character. For those who don’t agree, hardwood floors can be repaired more easily than laminate, with the latter usually requiring whole planks or tiles to be removed and replaced. Wood flooring, whether laminate or hardwood, is easy to clean day-to-day with a sweep and mop. When it comes to repairs, laminate planks and tiles, though more resistant to damage, once they are damaged will usually require replacement. 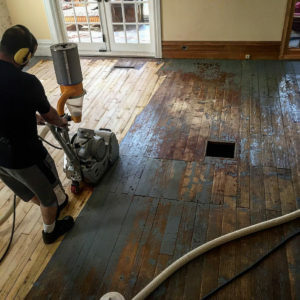 Hardwood floors, on the other hand, can be sanded and refinished.